This Sunday 28th April come along to Blackhaugh Farm for our Spring Open Day! 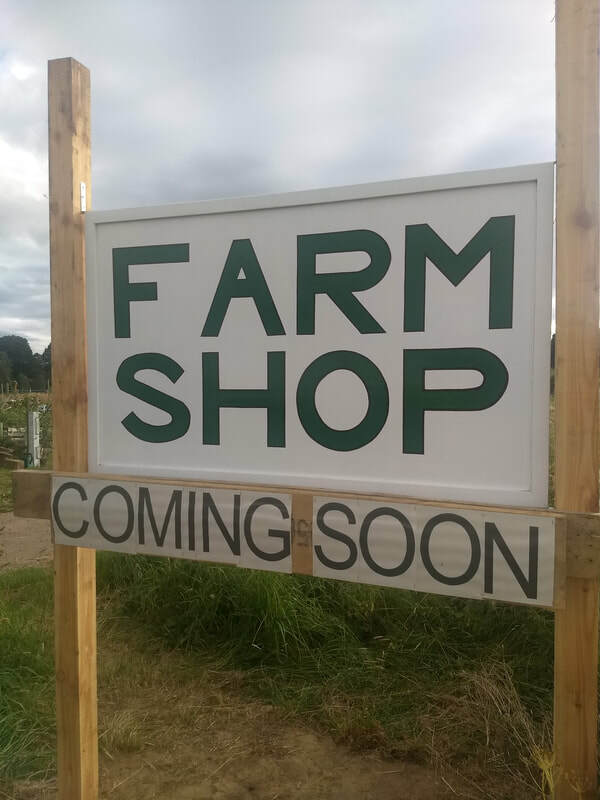 We will have farm tours, with Taybank Growers Coop for a chance to see what's happening in the market garden as well as our new wheat-growing project, and with our friends at Plants With Purpose. Starting 12pm, there will be free soup and cake, and activities for all the family, including scarecrow making and even a samba workshop! Before the afternoon closes at 3pm we'll be sowing the last of our Spring grain so come and lend a hand. See you then, in the sunshine...! As the ground warms up, we’ve been excited to start sowing our Spring grain. Most of it was drilled into the field at the end of March, in four sections each with a different variety or mixture of varieties. We are growing ‘heritage’ wheat varieties, which means those typically grown before industrialised agriculture. Ours were provided by Scotland the Bread after several years of research and harvests has allowed them to grow these at scale once more. These are more adaptable and resilient than modern wheats, more nutritious both for the soil and for us to eat, and most importantly more delicious! In short, all of these benefits are due to the much greater genetic diversity of these varieties. While of course we would like to have a bumper harvest, it is this diversity which matters more to us. So we are helping it even further: in our most ‘experimental’ plot we have mixed together at least 30 varieties, including a little rye, to create a unique ‘population’ mixture; and included in that is some grain given to us by Torth y Tir in Wales, with countless varieties within it. ...and the population wheat coming up three weeks after planting. This infinite diversity is the aim of future harvests at Blackhaugh Farm: to build and continually re-sow a ‘landrace’ grain population that is adapted to local growing conditions, nutritionally rich, and available for local people to eat, direct from the farm. More on this localising in a later post. Meanwhile, the wheat is coming up! 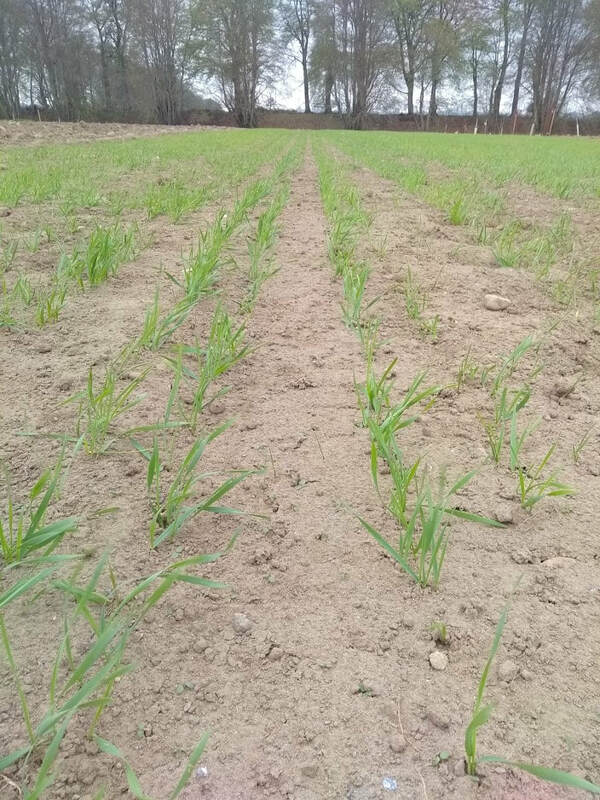 The first shoots were visible after about 10 days, and now, with a healthy mix of sun and rain, they are thriving into tillers. But you’ve not missed your chance to get involved. This Sunday 28th come along to the farm 12-3pm and we’ll be sowing the last of our population grain as part of our Spring Open Day. 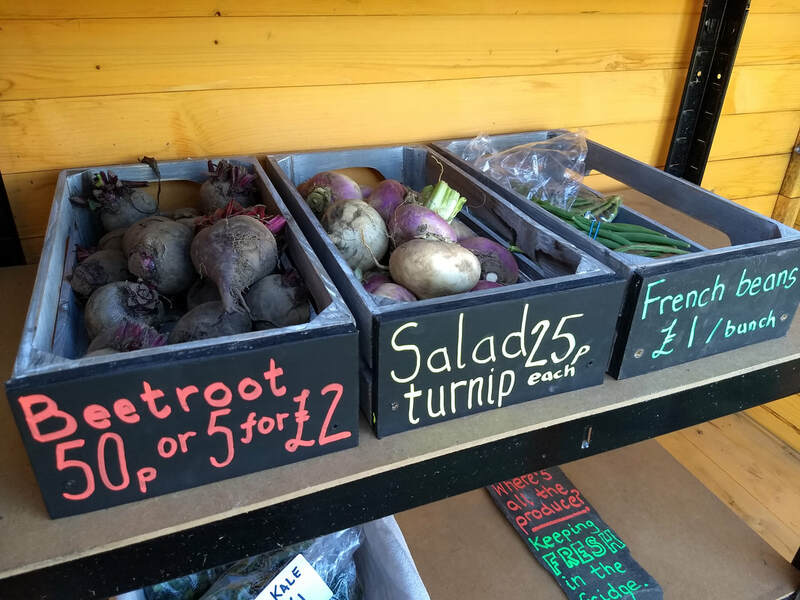 You can hear more about the project, and find out about taking part, as well as enjoying tours of the farm, family activities and some tasty soup and cake! ​Planting begins this weekend for our wheat project. Planting trees, that is! It is hardly a new idea; farmers have incorporated agriculture into native forests for millennia. But modern agriculture has stripped that away in favour of vast monocultures, and our landscapes are all but bare of trees. Agroforestry, combining trees on farmland with agricultural crops and livestock to try to reverse that trend is becoming more and more popular, as we recognise how much trees offer. They are good for the soil, taking in carbon and returning it to the soil through leaf litter. Trees also prevent soil erosion by binding soil to their deep root systems, which also take up nutrients to the surface; with this, and their water storage capacity, they are excellent flood defences. Trees are good for wildlife, presenting habitats to insects and birds, as well as microorganisms in the soil. And all of this means they are good for economically productive farming systems, which thrive on diversity and healthy soil, not least by offering another crop - fruit, nuts, or timber - and protecting annual crops from the elements. Farming in 3D, as the Soil Association puts it. With this in mind, we are planting a mix of apple trees, plums, quinces, saskatoons, hazels, and willow for coppicing, as well as some oaks (whose timber may be the Blackhaugh Farm pension fund...) We will plant in four long rows and between them sow three ‘alleys’ of spring wheat - on which more in the next blog post! We are excited this month to finally get our grain growing project off (and very soon into) the ground. By growing on a small-scale, working with the help of local people to provide them with food that is healthy, digestible, sustainable, and delicious, we’re aiming once again celebrate the Wheat We Eat. 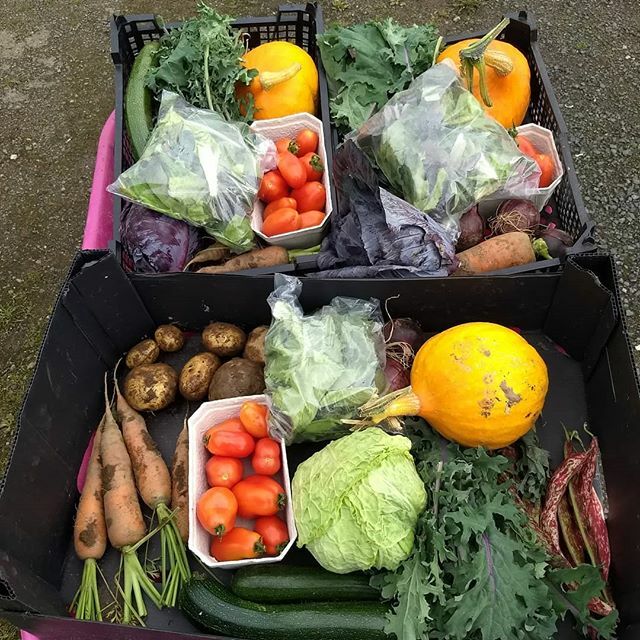 This Sunday 10th February is the TGC monthly volunteer workday, and a great opportunity to pop into the farm (from 10am onwards) and find out more about the project and share your ideas over some tasty soup - and bread, naturally. In March, we will be sowing just over 1 hectare of wheat - and we’re aiming to fit as many experiments into that relatively small area as we can! We hope this will help us to learn a lot, but if nothing else it will build a diverse environment very different from that of vast monocrop modern wheatfields. The major experiment, and a lasting one, is to plant four rows of native trees between which our wheat will be sown. 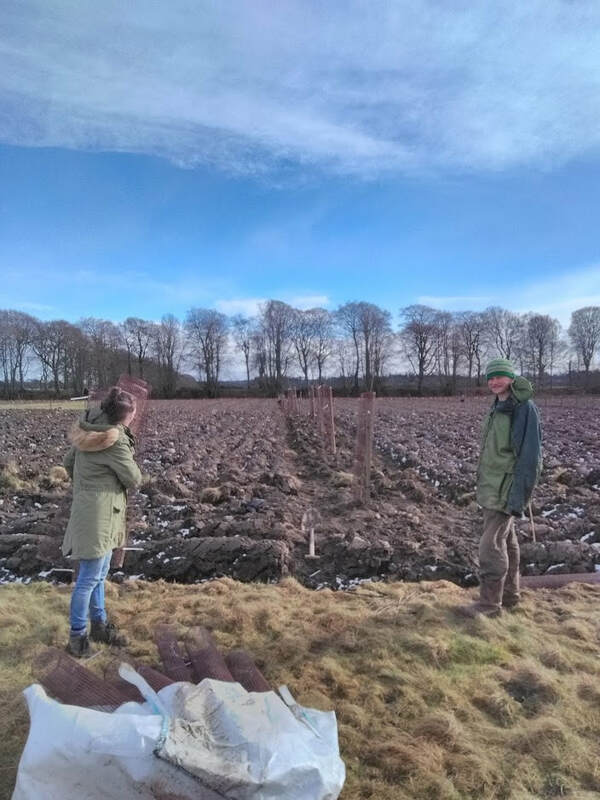 The benefits, both environmental and economic, of this method known as ‘agroforestry’ are various enough to warrant a blog post of their own (watch this space…)! Also look out for another post explaining exactly what we are planting, how and why. We have chosen to plant only ‘heritage’ wheat varieties, delicious, nutrient-rich, soil-enhancing varieties once prevalent but long since outdone by modern wheats bred in the interests of the commodity market rather than health or flavour. Our methods are also to be experimental, a mix of mechanical and manual, and that’s where you come in! We will host a number of workdays throughout the year, to lighten the work with as many hands as possible. First of all, we are planting trees, one of life’s most joyous activities. Come along on Sunday 10th March to help out! We are also looking for a small group of enthusiastic local folk to form a citizen science research group around the project. We feel there is much to learn, or relearn, and want to provide a space for that learning to be shared. If you are interested in taking part, email Charlie on c.hanks145@gmail.com for more details. Meanwhile, we’re getting out and about to encourage people to get involved, starting with our local primary schools. If you’ve any ideas of groups that might be interested, get in touch! 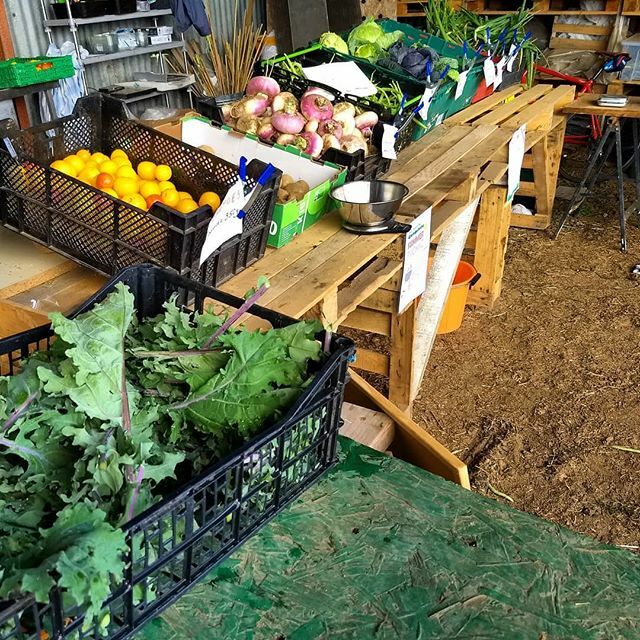 Taybank Growers Cooperative (Roz Corbett and Johnny Agnew) are looking for a third person to join their market gardening cooperative. 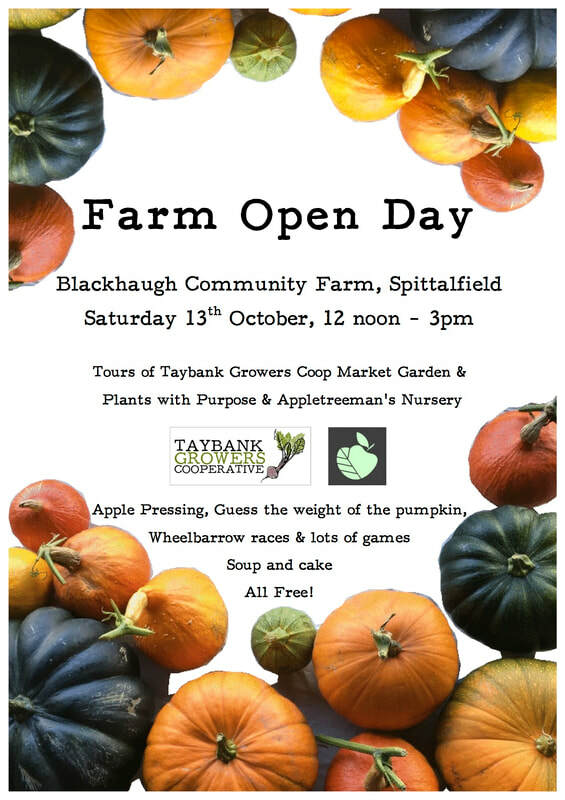 Based at Blackhaugh Community Farm, Spittalfield PH1 4JZ, we are about to enter our third year of running a market garden. 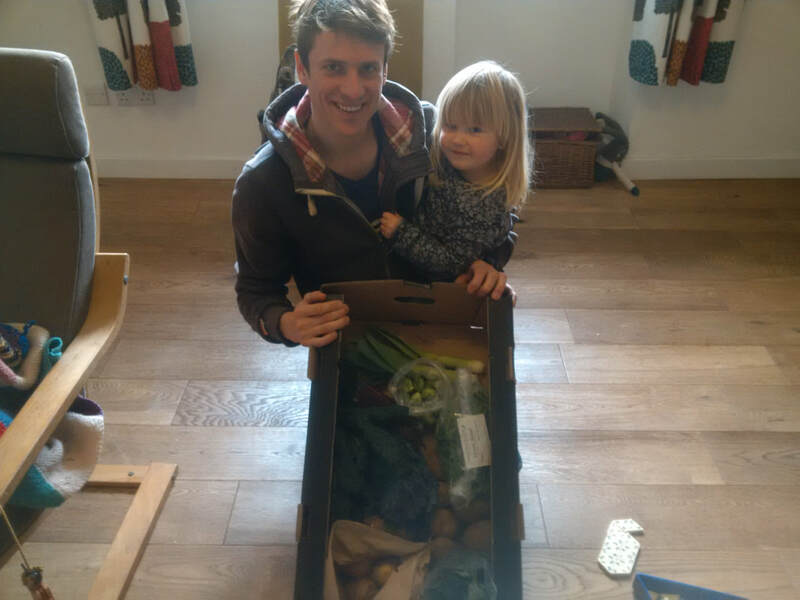 We run a veg box scheme, sell from the farm gate and to local businesses, all within 10 miles of the farm. 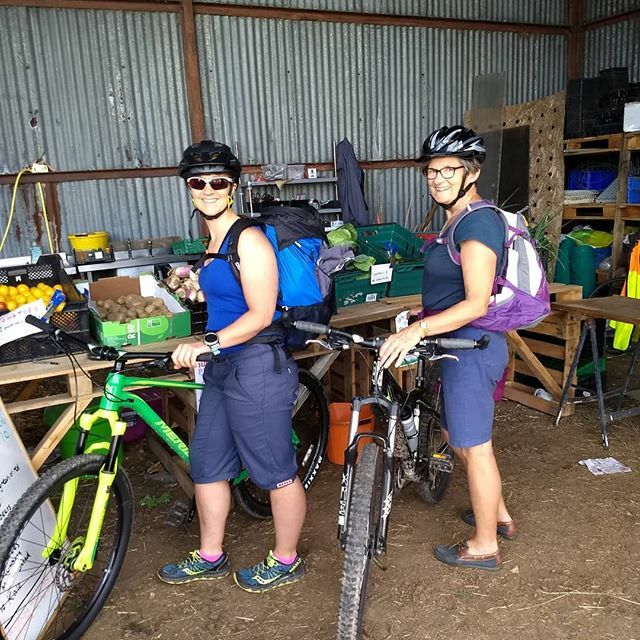 We have established significant infrastructure over the first two years including two polytunnels, a deer fence and multi-purpose shed and have gained support from the local community. 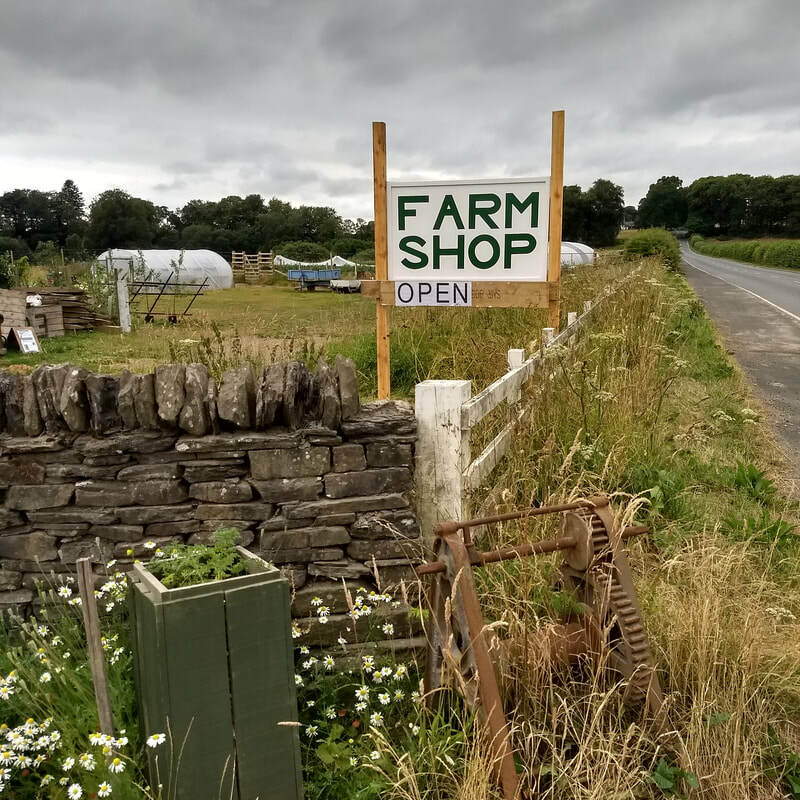 We are looking for someone with growing experience and business skills to help make our ecological, community supported farming project a success. The deadline for the Grower Director Post is 7th January, 5pm. - Project Coordinator for The Wheat we Eat, 1 day a week starting in January. Please have a read of the Job Descriptions below and get in touch if you have any questions.